Colombo, Sri lanka -- The two scholars who wrote on the comparisons between Marxism and Buddhism were Dr. Ambedkar and Dr Victor Gunasekara of Queensland University Australia. Dr. Ambedkar saw a very few similarities between Marxism and Buddhism.Dr Victor Gunasekara in his scientific article Marxism in a Buddhist Perspective states that Marx wrote extensively on religion but not on Buddhism which he did not really encounter. Dr .Gunasekara further says , “When we leave the critique of religion and God, where Buddhism and Marxism have something in common, and consider ether aspects, the differences in the two systems begin to emerge. These differences exist and are real; but they should neither be exaggerated nor minimized. We may commence by considering to what extent the three signata discovered by the Buddha could be traced in Marx's writings. The three fundamental laws discovered by the Buddha are that all phenomena are characterized by Impermanence (anicca), unsatisfactoriness (dukkha) and insubstantiality (anatta). As Dr. Victor Gunasekara points out both Marxism and Buddhism are humanistic philosophies. Both Marxism and Buddhism are philosophies of action. Because of their different perspectives on humanism the action which Marx recommended is social and political action. Now while the Buddha does not necessarily decry this kind of action where it leads to human betterment, the Buddha points to a higher ideal, and to a more fundamental kind of happiness. Karl Marx wrote the Communist Manifesto in 1848 explained how religion affected the society and how it was an institution that was not actually necessary to exist. Marx thought that religion was contagious on society. Karl Marx and Friedrich Engels were able to gather diminutive information about Buddhism via some articles which were published by Nietzsche and Arthur Schopenhauer. 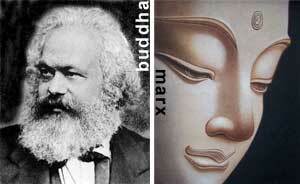 Marx considered Buddhism as a philosophy rather than a religion. Engels unmasks the true nature of theistic religion in an utspoken and forceful language. Marx was an atheist .A different interpretation of Marx's atheism is given by Erich Fromm. In his Marx's Concept of Man writes: Marx's atheism is the most advanced form of rational mysticism. Marx's atheism is based on rationalism, not mysticism. Similarly the Buddha did not lay the foundation of his religion either on god, or on soul, or anything supernatural. Karl Marx was an economist and a philosopher. Karl Marx, was an influential socialist thinker to emerge in the 19th century. Das Kapital is his major work on political conomy, capital, property, the state, wage labor, foreign trade and the world market. He described the economic law of motion of modern society. Das Kapital is a critical analysis of capitalism and its practical economic application. The central driving force of capitalism, according to Marx, was in the exploitation and alienation of labour. The world passes through alternating cycles of evolution and dissolution. According to Buddhism everything changes in nature and nothing remains static so as the society. Max Weber says that all communities are arranged in a manner that goods, tangible and intangible, symbolic and material are distributed. Such a distribution is always unequal and necessarily involves power. ''Classes, status groups and parties are phenomena of the distribution of power within a community. Marx had a special interest in philosophy of history and the social sciences. Marx's contribution to understanding of human society has been significant. He showed how economic factor affect the society. Marx’s theory of history ­ is centered on the idea that forms of society rise and falls as they further and then impede the development of human productive power. Marx' made a complex analysis of history and society in terms of class relations. Buddhism is a democratic system. Buddha admired the democratic and the republican of Government of Vajis in the state of Kuru. Buddha further mentioned that until Vajis were following their system, they would not be conquered. Capitalism generally refers to an economic system in which the means of production are privately owned and operated for profit and in which investments, distribution, income, production and pricing of goods and services are determined through the operation of a free market f . It is usually considered to involve the right of individuals and groups of individuals acting as "legal persons" or corporations to trade capital goods , labor, land and money . The defining characteristic of capitalism is its usage of capital. Capital is currency, a method of representing the sum of one’s material property for use in trade. Capitalist democracy divides the population into two or three classes. The highest social class consists of the fewest people. The lowest social class consists of the most people. Capital according to Marx is created with the purchase of commodities for the purpose of creating new commodities with an exchange value higher than the sum of the original purchases. For Marx, the use of labor power had itself become a commodity under capitalism; the exchange value of labor power, as reflected in the wage, is less than the value it produces for the capitalist. This difference in values, he argues, constitutes surplus value which the capitalists extract and accumulate. Buddhism explains human society like any other phenomenon that changes constantly. The economic aspect of a community profoundly affects its other aspects. In a Buddhist economic system the people deliberately use the state power to maximize welfare, both economic and social, from a given national income while enhancing the spiritual dimensions. The Buddha mentioned the economic aspect of life, such as: 'Poverty is suffering in this world. '(Anguttara Nikaya ) also he saw hunger is the most severe of all illnesses. From a Buddhist economic perspective, work is regarded as pure mindful activity which brings economic advancement and social harmony. From a Buddhist economic perspective, human beings should be skilled, efficient, courageous, honest and energetic in their work that brings battement to the society. Buddhist economics regards human work in terms of human fulfillment both in material and spiritual. The Buddha views life in terms of cause and effect. Buddha's teachings offer a grand insight into the nature of reality including practical aspects of mundane life. Buddha has given sensible guidance for the lay life and recommendations to cope with life's difficulties. Buddhism gives appropriate guidance to combine personal progress in worldly matters with moral principles. Marx believed in human equality. The Buddha was one of the first thinkers in history to teach the doctrine of human equality. Buddhism stands for a society of equals where democracy prevails. Buddha believed in a classless society. In his community the Page 4 Sangha has no class system. For the Buddha, all men are one in that they belong to one species. Social classes and castes are nothing but functional or occupational groupings. Poverty is not a virtue. Buddha in Cakkavattisihanada Sutta states that poverty is the cause of immoral behavior, such as theft, falsehood, violence, hatred and cruelty, behavior which often results in crime. The Buddha said, 'Poverty is a suffering in the world for a layman. Modern world suffer from over production, over consumption an eventually global pollution. Buddha said, 'There is no river like craving. Buddha encouraged the use of goods and services to satisfy the desire for true well-being. Buddhism offers man a simple moderate lifestyle avoiding both extremes of self- deprivation and self-indulgence. Buddhism emphasize that it is the duty of the government to see to the needs of the people and to strive to liquidate poverty. In 1844 Marx on Economic and Philosophic Manuscripts writes that oneThe worker becomes all the poorer the more wealth he produces, the more his production increases in power and range. The worker becomes an ever cheaper commodity the more commodities he creates. With the increasing value of the world of things proceeds in direct proportion to the devaluation of the world of men. Labour produces not only commodities; it produces itself and the worker as a commodity – and does so in the proportion in which it produces commodities generally. Utopia is place that does not exist. It is a fictional island with a perfect social, legal, and political system written by Thomas More. The term Utopia was based onPlato 's epublic. In the Utopia the evils of society, eg: poverty and misery, are all removed. People live in total hapiness. Some belive that the Utopia is the answer to human suffering. The Socialists are under the view that the Communist society can eradicate human suffering. As Marx explained global capitalism has brought great wealth for a few and misery for the vast majority and it has generated inhuman living conditions for most people. He articulated economic disparity is the main reason for human suffering. But Marx was unable to show the practical way to liberate human free will. Lenin who was a Page 5 revolutionary thinker masterminded the Bolshevik take-over of power in Russia in 1917. Based on Marxist philosophy Lenin created the first socialist state in the history. But after 70 years it was proved that the Soviet Union was unable to answer major economic problems which were existed for long years. Eventually the Soviet Union was collapsed. In 1843 Marx wrote -Religious suffering is, at one and the same time, the expression of real suffering and a protest against real suffering. Religion is the sigh of the oppressed creature, the heart of a heartless world, and the soul of soulless conditions. It is the opium of the people. Marx emphasized mainly on the economic aspects. Hence he missed an important dimension of human existence which is the spiritual aspect. The lord Buddha commented on every human aspects. Over 2,500 years ago, the Buddha articulated ideals of human suffering which has a universal meaning. The Buddha answered the central problem of human suffering and its ending where Marx addressed a limited area of human suffering which is mainly the mundane life. He missed the spiritual dimension of the human. When Marx stated “religion is the opium of the people” he implied the theistic religions. 3) Human suffering can be ended by ending human desire. 4.) Desire can be ended by following the "Eightfold Noble Path": right understanding, right thought, right speech, right action, right livelihood, right effort, right mindfulness, and right concentration. The nature of suffering is thus described by the Buddha. The eightfold path leads to the extinction of suffering.